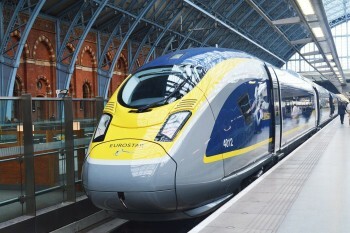 If you are a member of Eurostar Frequent Traveller or Eurostar Plus Points, you will have received an email yesterday announcing the merger of the two schemes into an, as yet unnamed, new programme. The little news we have is here. The date for the merger is not yet known. If you are a member of Eurostar Frequent Traveller, you won’t notice much change. Your points will be converted into points in the new scheme and life will continue much as before. Eurostar Plus Points is a different matter. This will effectively be closed, and leisure travellers will need to collect points – not cashback credit – in the new scheme going forward. There were a couple of comments on HFP yesterday along the lines of ‘here comes a massive devaluation’. I don’t believe that. It is probably two years since I first discussed the idea of a new loyalty programme with Eurostar, and they are not doing it in order to sneak through a devaluation. The bottom line is that, with the new Amsterdam and Rotterdam routes launching in early 2018, and potentally new German routes to follow, Eurostar Frequent Traveller was no longer fit for purpose. To date, the bulk of members are based in the UK or France. The limited number of redemption options reflects that, with very little apart from a handful of hotels and shopping vouchers available if you don’t want more train tickets. Going forward, Eurostar Frequent Traveller will be picking up a lot of new members from the Netherlands, Germany and elsewhere. This requires a programme with a far broader range of redemption options. With a bigger membership, it also makes it easier to arrange points earning partnerships with hotel and car hire brands. There will clearly be the need for a new redemption chart. At present, Eurostar is basically ‘London to somewhere’. Going forward, there will be routes which do not touch London at all, such as Brussels to Amsterdam. That said …. whilst Amsterdam will be a 3 hour 50 minutes train trip, the distance from London is obviously not a lot further than Paris. It would be odd if Amsterdam was priced at a premium to Paris, despite the 75% longer journey time. Will the exceptional value redemptions to the south of France survive? These were priced the same as the Paris trains for simplicity. Frankly, the main reason that I doubt Eurostar will leg you over is that the trains are not full. The ‘load factor’ is a lot lower than that of the major airlines, partially because it cannot switch between shorter and longer trains at different times of the day. There will always be plenty of redemption seats available. The only potential change I can forsee is on peak time redemptions (eg Friday nights to Paris) where a two-tier pricing system would better reflect the high cash prices. Should members have any concerns at all? There are clearly some points which will need clarification – the announcement yesterday was extremely vague. …. whether transfers from American Express Membership Rewards points will continue? My understanding is that, yes, they will. …. on the face of it, Eurostar Plus Points members look like they are getting a bad deal. The wording on the website implies that existing points will be lost unless you have the minimum required for a Eurostar voucher. I am assuming that this is not actually the case, and that all Plus Points members above a modest threshold will be given a Eurostar voucher for the balance of their account. There are bound to be concerns about the transfer rate from the old scheme to the new scheme, but we have no evidence yet of how that will work. Similarly, we have no idea if it will be easier or harder to qualify for status from 2018. I’ll keep you updated as I learn more about the changes. PS. 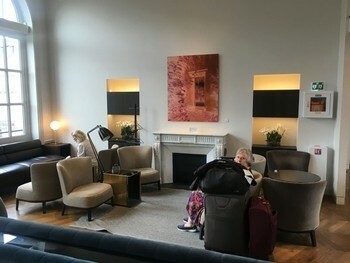 I was in the new Eurostar lounge in Paris on Monday for the first time. You may remember that Anika went to the press launch in February which was a rather OTT affair in terms of food and drink. 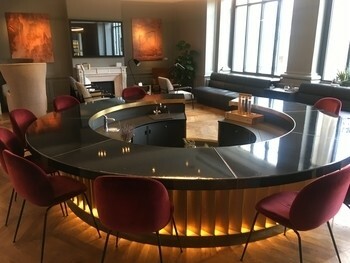 It is undoubtedly an impressive space, and I have heard good things about the cocktail bar which operates in the evenings. At noon, however, it was a rather empty place. The cocktail bar was shut (not surprisingly) but they did have a good selection of wine served via an enomatic system. There was no food, however. Nothing at all, apart from a few crisps and plain sponge cake. See the photos above. I thought that things would pick up as lunch approached, but when I boarded at 12.45 there was still no lunch available. It looks as if they are basically running on empty between breakfast and the evening peak, which is a shame. 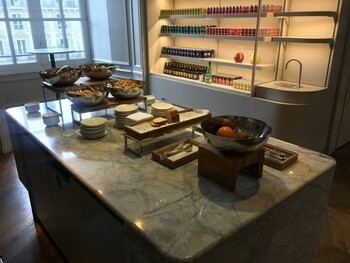 Even a tray of pastries would have been welcome …..
Whilst I was only travelling on a Standard Premier ticket, I was able to get into the lounge by flashing my American Express Platinum card. This works at any Eurostar lounge. No guests are allowed, although I have been allowed to take my children in at quiet periods in the past. A bar/restaurant called Divino Enoteca in Edinburgh has one of these, also seen them before in the Sydney Qantas Domestic business lounge – great idea! I have noticed a considerable difference in the way the prices on the Paris route have changed . Previously it has simply been the earlier you book the better and the prices rise gradually to departure date . Currently the prices are bouncing around. I even wondered if they had a system now that picked up your enquiry linked it with cookies or whatever is necessary and returned rising prices , being technologically challenged I have no idea if its currently feasible , but I can only say the pricings became very suspicious and rose on a number of occassions I returned to enquire and then miraculously fell after a booking was made , not related to their recent offer either . Anyway I believe its detrimental to them in terms of early bookings , as people wise up they will wait , it will become a game . You would think the earlier they know the fill the better for them in planning terms . Something I used to trust is no longer the case , but that seems to be the model these days . Knowing who you are (whether using cookies or IP address) and so adjusting the prices is very feasible, and your experience suggests that it is happening there. You have well described the difference between Discriminatory Pricing, and Dynamic Pricing. Different sites work differently and are “clever” enough to resist different countermeasures. Possible techniques are: log out from their login, switch to a different machine, use a different browser, delete cookies. Increased cost of redemption on the Friday bookings would be a blow – that’s a major draw of the loyalty programmes for me. Presumably if merging the programmes they will have to do away with the tough expiry rules for EFT accounts? Yes, I imagine so. I also imagine there would no longer be restrictions on opening an EFT account, albeit an Amex transfer overrides those anyway. PS have never seen much food in the Paris lounge, even in the early evenings when the bar is open it’s basically nuts/olives – I think that press launch was very misleading! We didn’t expect that but had little else to work from. It’s my wedding anniversary bank holiday weekend we are off to Paris for the weekend – any tips for restaurants/bars would be great. Also, do you think I’ll be able to blag both myself and my wife in on the one Amex platinum card, or are they strict on it? It’s not that fancy but I like Le Coin near Villiers. The fois gras, langue de chat and rum baba are fantastic. Also, best sushi I’ve had outside of Japan at Le bar a sushi izumi (they’ve recently moved premises and I’ve not been to the new gaff), also near Villiers. depends on your budget/preference on décor and atmosphere… personally I like traditional bistros (the kind with red checkered tablecloths), e.g. Polidor near Jardin du Luxembourg, Au Pied de Fouet near Musee d’Orsay. Bistrot Paul Bert is supposedly very good too. The area near Canal Saint Martin has very good wine bars. Doesn’t your wife have the supplementary card on your Platinum? If not, order one now – it’s free (as long as no-one else has a supp on your account already) and will arrive in a week. You may even see a targetted offer on your Amex account for 5,000 points for adding a supp. A few ideas, William Ledeouil is in my view one of the best chefs in Paris right now, his flagship Ze Kitchen Gallery is Michelin starred but he has a less well known bistro called KGB (Kitchen Gallery Bis) nearby which serves very similar food ( French/Asian crossover, think classic jus with lemon grass ) and is cheaper and easier to get in to, I think you will love it. For a really traditional bistro /bar try Les Pipos on Rue Montagne in Quartier Latin, my local, simple good bistro food, always packed with locals, jazz on a Friday and Saturday night, romantic in a very 5eme way. Some wonderful suggestions in this and some of the posts above. Really worth making a note of for future reference. There is a website which discusses where you can eat for €10 or less in Paris, and I had a great time plumbing that a year ago. I found some really decent places, one of which was filled with romantic couples. Interestingly, it was the Guardian that flagged this site for me. I wouldn’t trust Eurostar to be fair on anything. Many years ago, in their relatively early years, I recall Eurostar changed the conditions on existing already purchased “Select” (I think it was called) tickets so they could no longer be changed. It was clearly illegal when the tickets had been purchased stating they could be changed but suddenly they introduced new conditions and refused to allow changes. I got caught not able to do changes I had relied on for the return half of my ticket. In those days I was too busy to sue… but they richly deserved it. So I wouldn;t trust Eurostar to be fair on anything. I’m confused about my 4 x RFS flights to Nice next summer (but still very pleased I got them!). The Manage My Booking page now refers to BOB, but has let me order child meals for the two 12 year olds and sent me an email confirming this! isn’t that on one of the funny planes they normally use at London City Airport?